15W Interview // Clearlove: If we can make the finals, we can beat SKT. Even after losing to SKT, EDG has managed to make it to the top 8. 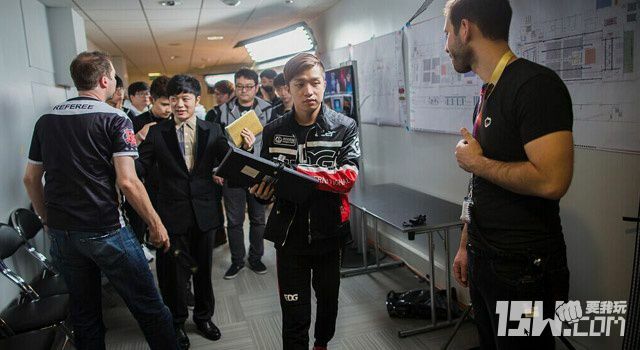 After theirgame, we interviewed EDG’s jungler, Clearlove. He’s stated that if they meet SKT again, they have confidence they can beat them. Even after losing to SKT, EDG has managed to make it to the top 8. After their game, we interviewed EDG’s jungler, Clearlove. He’s stated that if they meet SKT again, they have confidence they can beat them. In your second game against SKT, your team was being pressured a lot. What do you think set the pace for the game? Clearlove: I think in my first gank bot lane, our teammates didn’t communicate well. We weren’t able to follow up on Tristana or Morgana. If we did, we should’ve at least gotten one kill. At then Elise roamed to top tower, making a really unfortunate situation. Marin managed to take advantage of the lane, and we were completely pressured. We needed to use TP to maintain some pressure in the lane. Marin didn’t need to use TP, so our bot lane refused to play aggressively. That was basically what set the tone for the game. Why didn’t you decide to help out top lane? Clearlove: Because I thought we had a chance in bot lane. We thought they’d lane swap, but they didn’t. At the time, we started blue buff. If I went from blue to red, and if Elise was playing well and decided to interrupt my red, I wouldn’t be able to guard. Also, they had Tristana and Morgana, which means they have to push. If I succeeded in my gank bot lane, and if I were able to get some more wards and items, it’d turn out better. If our top lane wasn’t pushed out, the game would’ve gone much smoother–and we would’ve won. Talk to us about the team’s injuries and sickness. There were a lot of rumors about them. Clearlove: Everyone knows about Pawn and Koro. For me, after coming here, I felt like our practice rooms weren’t that good. That caused me to get sick. I felt like it was difficult to breathe because the practice rooms were so small. I started to cough and I eventually got a cold. My head hurt too. Everyone else was okay. When you played against BKT, you fell behind in the beginning. What were you thinking at the time? Clearlove: I was thinking–let’s hurry up and get a team fight so we can hurry up and win the game. Clearlove: Yes, I was nervous. But I felt like we could still win if we capitalized on their mistakes. Is it worth fighting over Rek’Sai? Seems like recently you’ve been fighting for ADC champions for Deft. Clearlove: I think Rek’Sai and Elise are both really strong junglers. Fighting over them is necessary. I just have to see if I want it. If you lane swap with these two champions, you’ll be restricted because they really rely on ganking lanes early. If you lane swap, these two champions might end up really passive in team fights. In the recent games–whether it’s against SKT or a weaker team like BKT–your jungle invades haven’t been that strong. Why is that? Clearlove: It has to do with the champion I chose. I chose Gragas three times today. He’s a champion that needs to farm and does well in team fights. If you throw a good ultimate in a team fight, you can win. Our opponent chose Rek’Sai, Elise–these kinds of champions. So they’ll play more aggressively, and take advantage of the game. You can only win if you snowball. So the champion you choose dictates how you’ll play the game. Can you talk about your upcoming plans? Clearlove: We’re going to relax tomorrow. The day after tomorrow, we’ll retreat to our practice room and watch the games. I’ve heard that you only have six computers. That might mean a sub won’t be able to play. Does that inconvenience your training? Clearlove: I don’t think so. Koro was sick before so he’s recovering right now. We’ll have to see who plays well in practice to determine who’ll play in the bracket stage. Also, it’s up to the coach. Pawn has recently chosen champions that are more team fight oriented, as opposed to the assassins he played in the Spring Split. Why is that? Clearlove: Because this patch favors champions with good wave clear. This is Worlds. For the Spring Split, he’d pick a lot of champions he just wanted to play. He wanted to refine his play. But at Worlds, he’s playing for the team. But if there’s a chance, he’ll choose champions like Yasuo or Leblanc. In these two games against SKT, there seemed to be a pretty big discrepancy. Why is that? Clearlove: The first time we lost, it’s because we weren’t used to NA/EU lane swaps. Our top lane lost, and that snowballed the game into our loss. The second time, I think our pick and ban was better than SKT, but we didn’t execute our gameplay correctly. After these two losses to SKT, do you think you still have a chance? Clearlove: If we meet SKT again, it’ll probably be the finals. If we can make the finals, we can beat SKT. I have confidence, and so does Meiko.